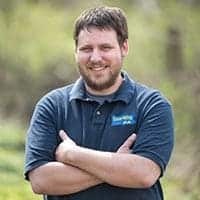 Looking for waterfalls near Pittsburgh, PA? You’re in luck because the region is home to some great waterfalls that are worth the drive. 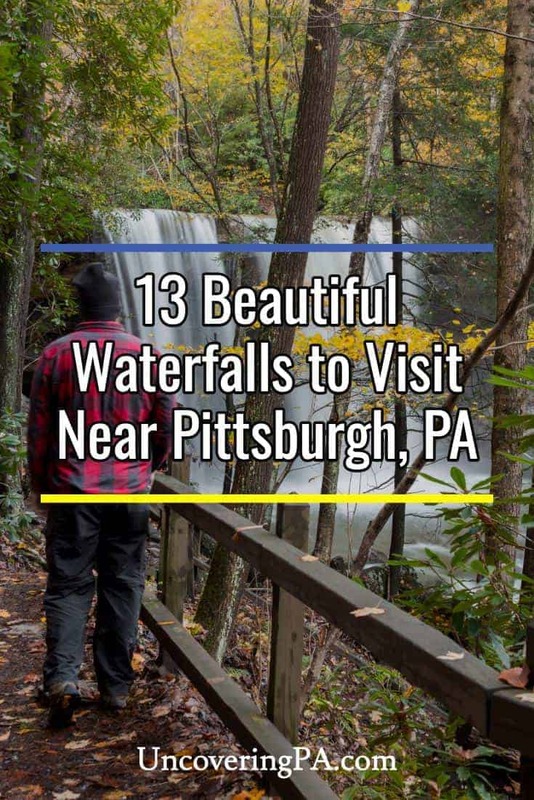 I’ve compiled some of my favorite waterfalls to visit near Pittsburgh to help you plan your explorations including Fall Run Falls, Cucumber Falls, Buttermilk Falls, Hells Hollow Falls, and many more. Whether you are looking for a roadside waterfall or want to go for a great hike, you won’t want to miss these falls. 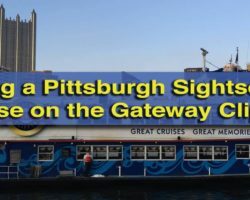 All of the waterfalls listed below are within about a 90-minute drive of downtown Pittsburgh, making them easy to visit on a day trip outside of the city. Click the link in each description for more information about the falls and its location. 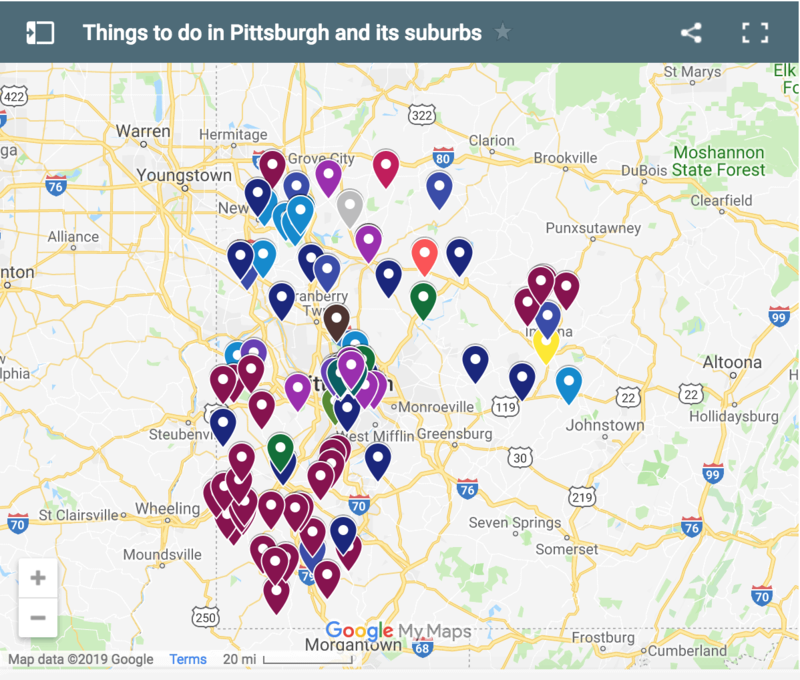 Here are a few of my favorite waterfalls near Pittsburgh. Fall Run Falls is the closest waterfall to Pittsburgh. If you are looking for waterfalls in Pittsburgh, look no further than Fall Run Falls. 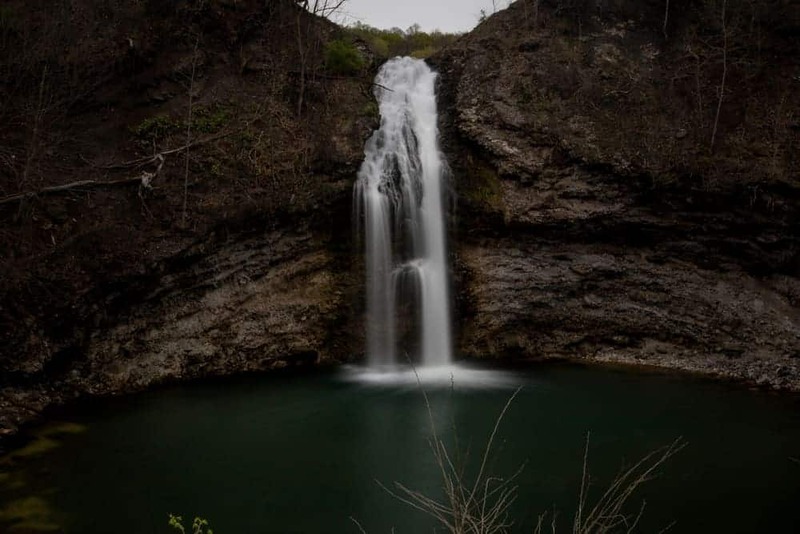 While technically located outside of the city limits, it only takes a few minutes to drive to this great waterfall from the downtown area. Fall Run Falls is located in Shaler’s Fall Run Park. This park features a meandering trail that travels roughly half a mile back to this beautiful waterfall. While not the largest waterfall in western PA, Fall Run Falls offers a great chance to see a waterfall close to Pittsburgh. Springfield Falls near Grove City, PA.
Springfield Falls is located near Grove City, Pennsylvania on state game lands. This waterfall is located less than 100 yards from the parking area, making it a great destination for those looking for something quick to see. The waterfall can easily be viewed from above, but seeing it from water level requires a bit of a steep descent. Nevertheless, it’s a beautiful sight from either spot. There are many Buttermilk Falls in Pennsylvania, but one of my favorites is the Buttermilk Falls in Indiana County. 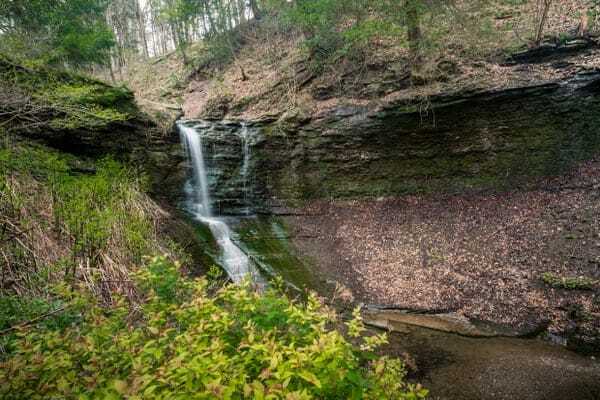 Located a short distance off of Route 22, the land around Buttermilk Falls was once owned by the grandfather of Mister Rogers, and he would often come here as a child. Today, visitors can stroll the short path to the waterfall to see this roughly 40-foot waterfall. Recently, a path was added around the falls that allows visitors to safely walk behind the flowing water. 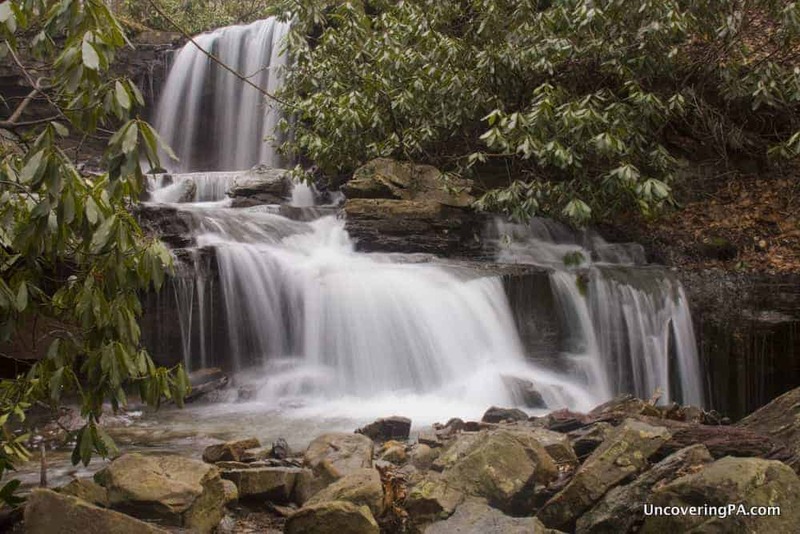 Cucumber Falls is one of several great waterfalls in Ohiopyle State Park. Ohiopyle State Park is one of my favorite state parks in Pennsylvania, and there are a ton of great waterfalls there to explore. Instead of simply listing one here, I figured I’d lump the many great waterfalls into one spot on this list. 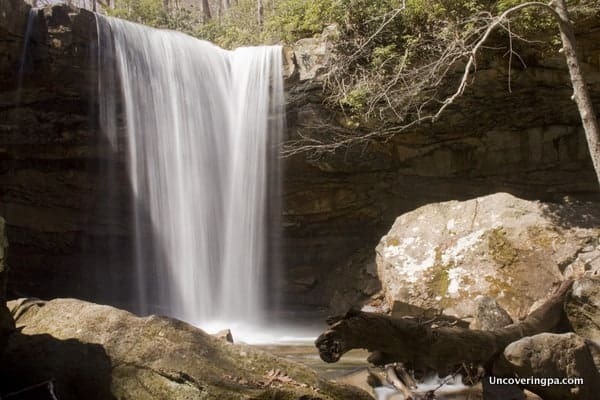 If you are looking for easy to reach waterfalls, try Cucumber Falls and Ohiopyle Falls. Those looking for a bit more of a hike won’t want to miss the waterfalls on Jonathan Run. Big Run Falls is located in New Castle’s Cascade Park. Once home to an amusement park of the same name, the park is now best known for its great waterfall and the few remnants that remain of the park. 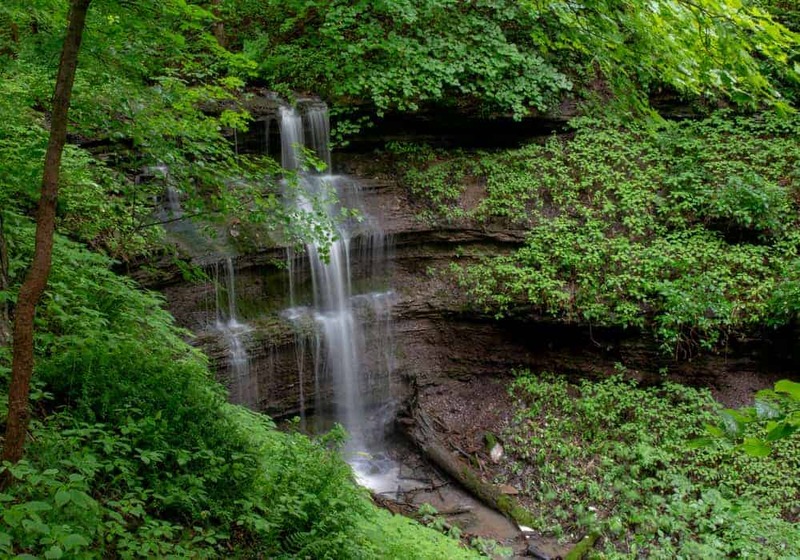 Big Run Falls can be easily viewed from above just steps from a parking area, and its proximity to McConnells Mill State Park and the city of New Castle makes it a great waterfall to visit when in the area. Yoder Falls is hidden away near Johnstown. 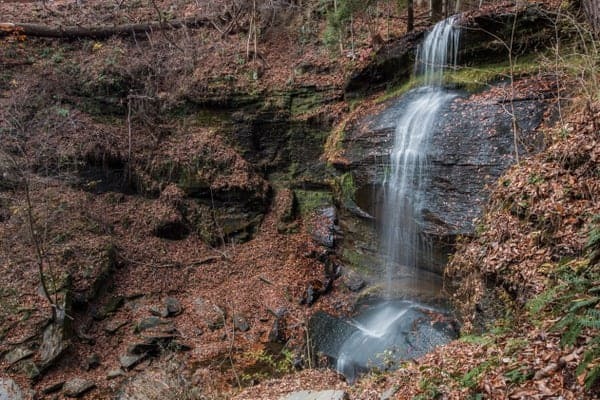 If you’re looking for a little-visited waterfall near Pittsburgh that requires some difficult hiking, then Yoder Falls is for you. Located just south of Johnstown, Yoder Falls is hidden in the woods and can only be seen by descending a steep trail, and then climbing directly up the stream bank. However, for those with an adventurous spirit, this 30-foot waterfall is well-worth seeing. Buttermilk Falls (also known as Homestead Falls) is located just off of I-76 in Beaver County. Visitors can view this falls from above near the upper parking area or can hike a short distance through an old quarry to see the impressive waterfall. 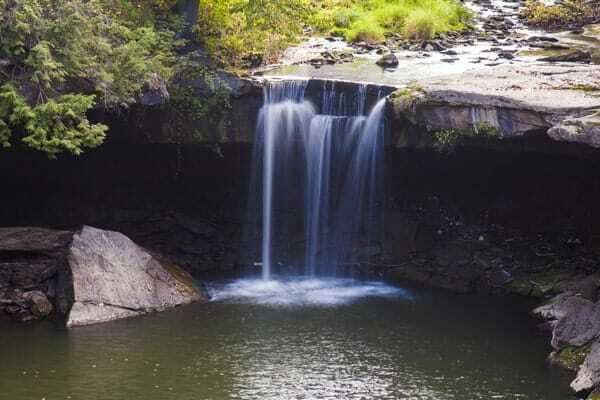 Buttermilk Falls is a plunge waterfall and is one of the most dramatic in the region. 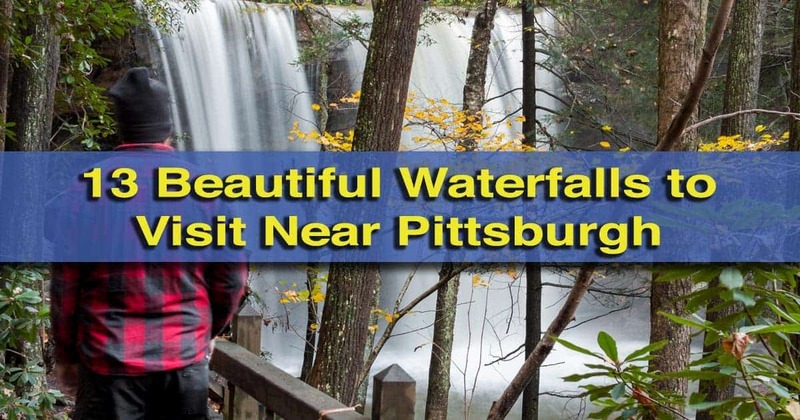 There is also a small overhang that allows visitors to walk behind this scenic waterfall near Pittsburgh. 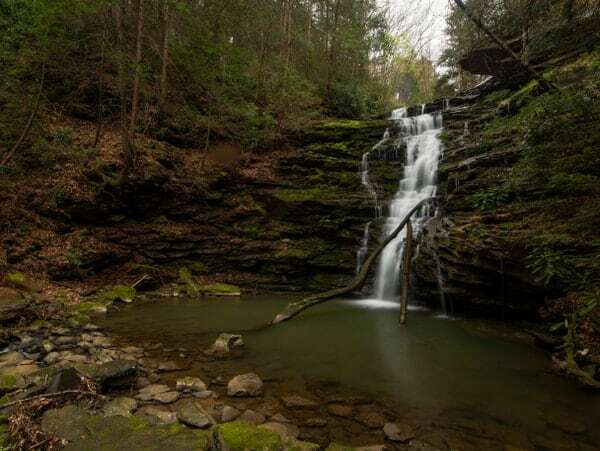 East Park in Connellsville is home to two small, but scenic waterfalls that are worth a stop when in the area. This set of double falls is located steps from the parking lot and can be seen from the road leading into the park. These two drops are each roughly 6-7 feet in height, but their close proximity to each other and their location in the middle of a local park make them great choices to visit. McConnells Mill State Park is located north of the city and is another great park for those looking to see waterfalls near Pittsburgh. The most famous waterfall in the park is Hell’s Hollow Falls, which is located along a beautiful trail. However, the park is home to several other great waterfalls including Alpha Falls and Breakneck Falls. 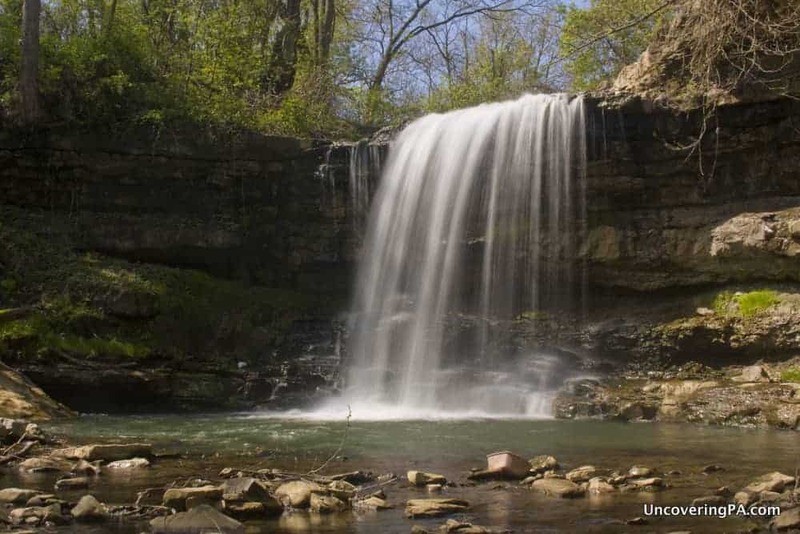 Frankfort Mineral Springs Falls is located west of the city in Raccoon Creek State Park. This waterfall plunges off of the rocks at the end of a short trail. Next to the waterfall, a small spring flows off of the rocks. This spring was once thought to have healing powers, and a resort used to be located nearby. Just above the falls, you can still see the foundations for one of the resort’s structures. Fallingwater sits above a beautiful waterfall. 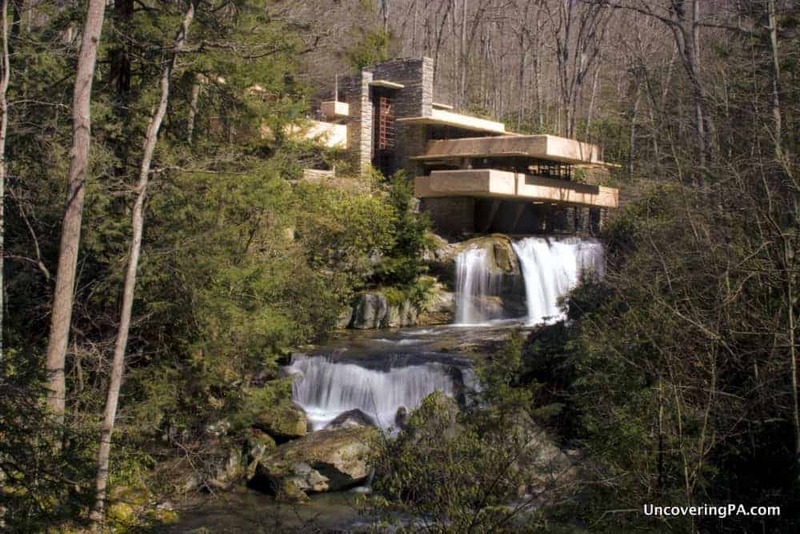 Of all the homes built by Frank Lloyd Wright, known are better known than Fallingwater. 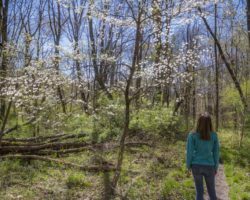 Located southeast of Pittsburgh near Ohiopyle State Park, the home is open for tours throughout the year. Fallingwater is built directly over a waterfall on Bear Run, and the most iconic image of this structure features this beautiful scene. Even if you don’t want to tour the home, a grounds pass will allow you on-site to see this scenic spot. Hinkston Run Falls is a beautiful roadside waterfall near Johnstown. Hinkston Run Falls is an impressive roadside waterfall near Johnstown, Pennsylvania. Here, the water from the nearby reservoir flows off of a natural cliff face, creating one of the most impressive roadside waterfalls in the state. Visiting this spot is easy, but make sure to stay on this quiet back road as the land adjacent to the falls is closed to the public. Cole Run Falls in Somerset County, Pennsylvania. Cole Run Falls is hidden away in Forbes State Forest near Seven Springs. After traveling along back roads for several miles, the parking area for Cole Run Falls is mere steps from the top of this beautiful waterfall. 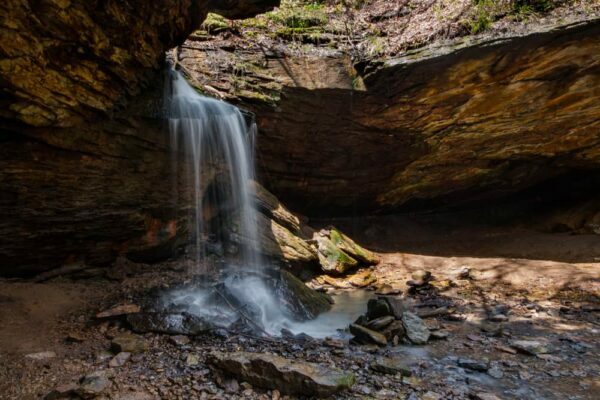 Cole Run Falls is less than 15 feet in height, but its unique shape and seclusion make this a perfect spot for waterfall lovers to visit. Braddock’s Falls is a beautiful waterfall that is only about 35 minutes from downtown Pittsburgh. Braddock’s Falls is located in Braddock’s Trail Park in Westmoreland County. Sitting only about 35 minutes from downtown Pittsburgh, this is the second closest waterfall to the city. Braddock’s Falls is approximately 20 feet high and sits in relative obscurity in this little-visited park. However, the waterfall is not only incredibly beautiful, but it’s also fairly easy to reach, requiring a hike of less than five minutes to see. Those visiting the park also can enjoy ruins, a great vista, and springtime wildflowers. 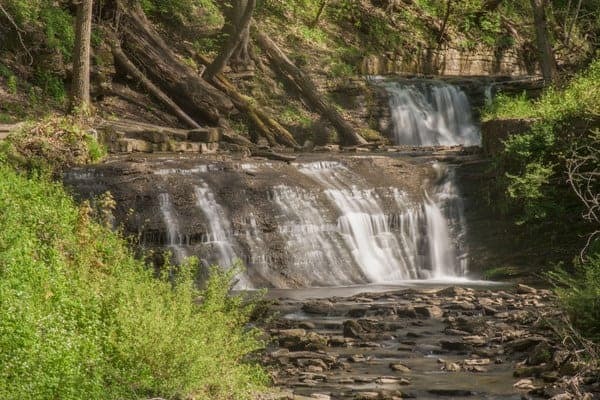 It should be noted that Braddock’s Falls is rather seasonal, so it’s best to visit when water levels are higher such as during the spring thaw or after a heavy rain. Robinson Falls is located in Connellsville, PA. 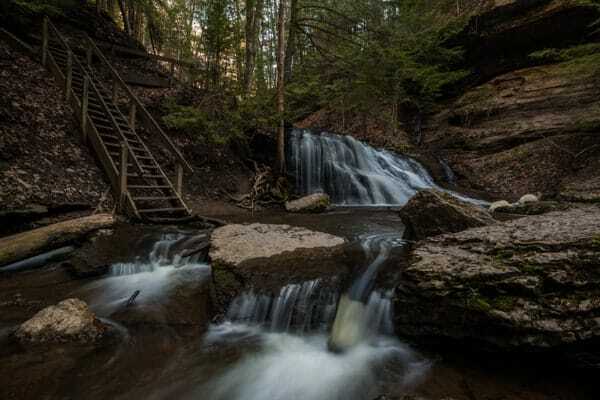 Located in Connellsville, less than an hour from downtown Pittsburgh, Robinson Falls is a scenic spot that’s often missed by those looking for things to do in the Laurel Highlands. 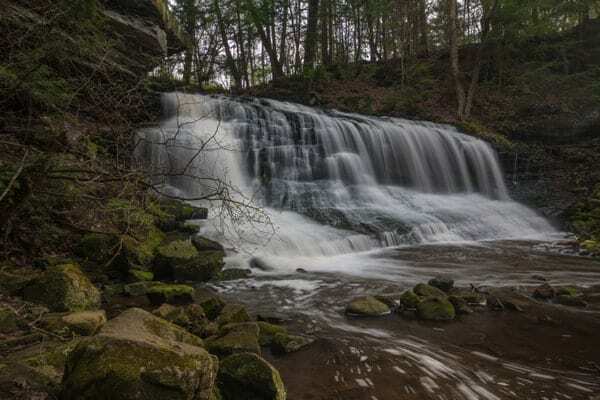 Robinson Falls is located on private property but can be easily seen from above from the road, making this one of the easiest-to-reach waterfalls in PA. During my visits, there haven’t been any “No Trespassing” signs, but getting to the bottom is quite a challenge regardless. Still, even from the roadside, this is a beautiful waterfall near Pittsburgh. 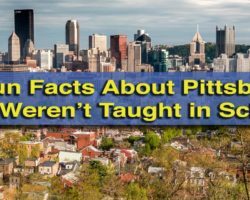 Know of any other public waterfalls near Pittsburgh that are worth exploring? Let us know in the comment section below. 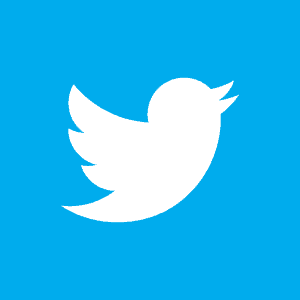 Want to explore more? 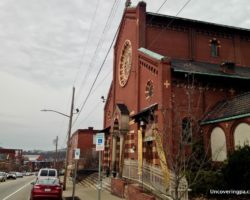 Check out our top Pennsylvania waterfalls, the best waterfalls near Philadelphia, and the best free things to do in Pittsburgh. Buttermilk Falls is awesome place to visit. 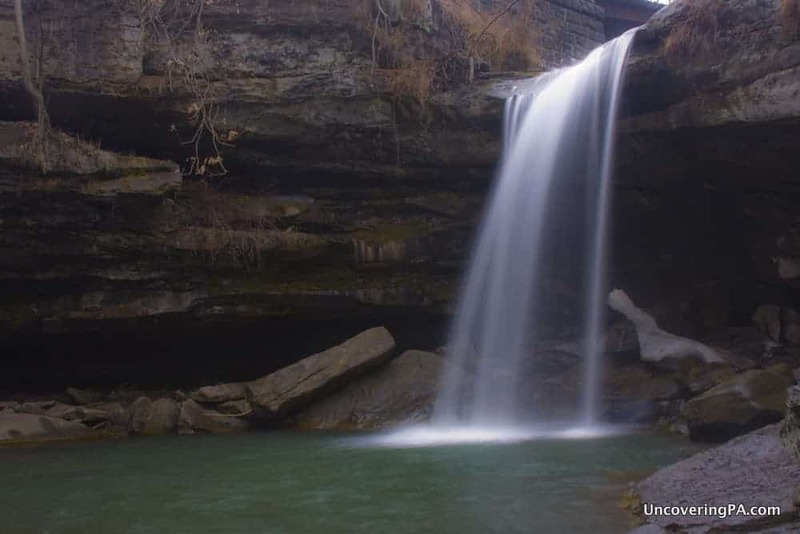 Do you know the name and directions to a waterfall near Perryopolis. Teenagers used to go there to drink and skinny dip? I don’t sorry. I only research and check out legal waterfalls, and I don’t know of any in the area. I have pics of both if interested all easy access legal public property. I’ve ridden the GAP, so I’ve passed them (unless you are referring to ones on a different trail or off-trail). Since they are mostly seasonal, I decided not to include them here.